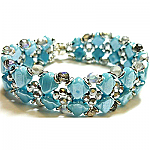 GEMs project is combo of RAW and Peyote embellishment designed by Kathy Cook. Kit comes with beads and instructions. Etched Fire Polish, Fire Polish, GEMs, Obeads and 11/o come bagged together with a trailer hitch clasp!